Many are familiar with The Stockdale Paradox. This concept, coined by Jim Collins in his book, Good to Great, came to be during a fantastic interview with the late Vice Admiral James Stockdale. For those who do not know the story, Admiral Stockdale was a Prisoner of War for more than seven years in Vietnam, and became known for his resiliency and leadership. Though the lesson of The Stockdale Paradox is timeless and invaluable, the story is a bit intense to be explained to my four-year-old. Below are three simple methods I often use to convey this valuable lesson. Early in my military career, I made the choice to enter a difficult training program. The washout rate was high and my confidence level was low. By focusing on my goal of graduating, throughout multiple small failures, I was able to make it and do more than I originally believed possible. Modern sports present numerous examples of underdogs who held on to overcome adversity. Doug Flutie was too small to play quarterback. Herschel Walker was too heavy and slow to even become an athlete. These stories are prevalent, and children can relate to them. These are perhaps the most fun. Shrek experienced a difficult journey. So did Nemo and Dusty Crophopper the crop duster. With each example, children can understand how the characters may have felt. In a culture flooded with information, the valuable lessons of faith and discipline are constantly available for presentation. Those who enjoy the stories can witness how the characters chose their focus. Children love narratives of this nature, and their parents have the opportunity to emphasize simple, positive concepts. As children mature, stories that once seemed fun and entertaining often become more meaningful, given a little life experience. Great topic, John. 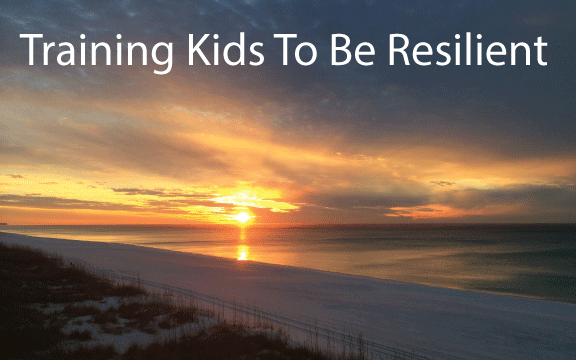 I’d like to add that in addition to, and possibly more important than, developing narratives from personal experience is actually exhibiting resilience as a parent in day-to-day experiences. When children actually see their parents working through adversity, not being deterred by obstacles and refusing to have a defeatist attitude in even the most mundane tasks in life, they often mirror those behaviors when they are faced with various situations.